Karyn Brantley holds an ISSA Master of Fitness Sciences Certification and is a Strength and Sports Conditioning Specialist. Brantley has been writing health and wellness articles, motivational speaking, and personal training since 2001. Brantley has experience working with clients of all fitness levels including professional athletes such as Prince Fielder of the Detroit Tigers early in his MLB career. Water workouts may be considered low impact, but they can be extremely challenging and beneficial. A pool workout can be just as effective for seniors as it is for athletes who want to improve their explosive power. A particular benefit of a pool workout is that the water protects the joints from impact when performing repetitive movements. The most obvious exercise you could do in the pool is swimming, which could increase your jump height for two reasons. Regardless of swim style, you must use proper form, which most often requires quick and controlled leg movements at a rapid pace as well as explosive turn-arounds off the wall in between each lap. Both of these maneuvers require explosive strength, which directly influences your jump height. If swimming is a new addition to your workout, muscle fatigue will most likely set in quickly as you develop this explosive strength, but results are soon to follow. The depth of the water influences the difficulty level of the movements. When performing jump squats, stand in water up above your waist if you are an advanced athlete; stand in a bit shallower water if you are a beginner. When doing the jump squats, attempt to blast out of the water as far as possible and land with your knees bent. Immediately do another squat. This exercise allows you to fight the resistance of the water, which means you will be able to jump even higher in the air. For this exercise, you will want to be in water up to your chest. You will begin by standing on your tip-toes with your legs together. Place your hands by your sides. Think of your body as a rocket while you rapidly hop up straight, keeping your core tight and aiming to keep your arms and legs in place. This pool exercise will strengthen your calves and core while the water cushions the impact to your knees and ankles upon landing. Jump lunges are important for improving your jump height, because not only do they work on your vertical power, they also incorporate a forward and backward explosive component to work the muscle fibers in another way. To perform this exercise in the pool, you will need to stand in water up to your waist. You will begin in a static lunge position. In one movement, you will hop off the pool floor and switch the position of the front and back legs before landing. This must be a quick and precise movement and the core must be kept tight while you do it. 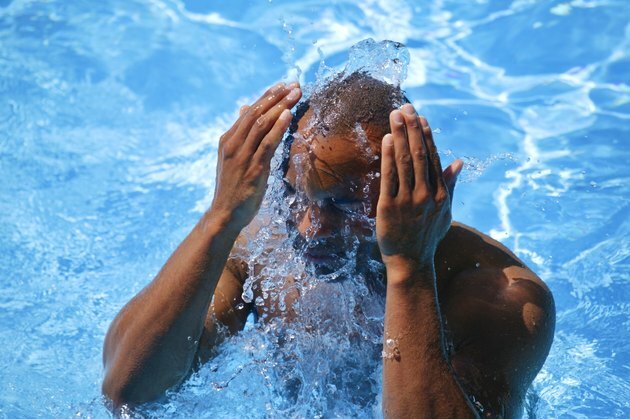 The resistance of the water helps develop the muscles that will help you jump higher.